"Keep the faith. Steal the rest." 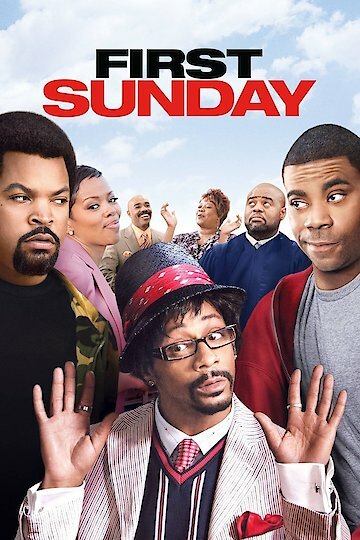 Starring Tracy Morgan, Ice Cube, Katt Williams and Chi McBride, First Sunday is a comedy that was released in 2008. The film is 98 minutes long and is the first film directed by David Tolbert. David Tolbert wrote the screenplay, as well. Best friends played by Ice Cube and Tracy Morgan, Lee John and Durell, are petty criminals. After being fired from the electronics store they both are employed at, the friends have a difficult time finding another legitimate job. Durell has a criminal record, so it makes finding another job even more difficult. In order to keep his son and his mother from moving to Atlanta, Durell needs to make enough money to pay his ex's lease on her business. The men decide to do a job for a con man named Blakah to help raise the funds needed quickly. The men, cornered, must do whatever they can to make sure that all of their bases are covered. Unfortunately for the small time criminals, they are not very stealthy in their endeavors and wind up getting arrested for stealing wheelchairs. Their punishment is 5000 hours of community service. In addition, they must pay Blakah $12,000, which covers the wheelchairs that were not delivered as promised. The men think of a way to steal from their church. Unfortunately for them, things do not go as planned. The men end up getting stuck in many ways, including physically, in the church. Ultimately, the men must come to terms with their mistakes. First Sunday is currently available to watch and stream, buy on demand at Amazon, Vudu, Google Play, FandangoNow, iTunes, YouTube VOD online.